This 18″ adult was photographed in a 2000 gallon aquarium in Hong Kong by Michael Del Prete. Camera: Nikon F. 55 mm Auto-nikkor lens set at f:6.3. Kodacolor ISO 100 film. Electronic flash, X synch. 1/60. 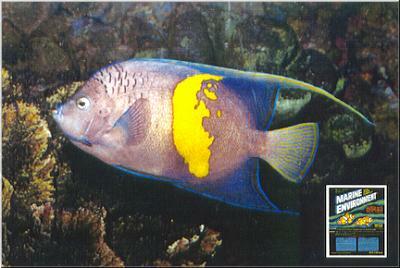 The blue moon angelfish (Pomocanthus maculosus) is collected from the Red Sea, Persian Gulf and Northern and Western Indian Ocean. In nature the blue moon grows to about 18″. In captivity as in nature the blue moon angel eats a variety of foods. The blue moon can be fed: high quality flake foods, fresh clam, mussel, prawn and specially prepared vitamin enriched frozen foods. The FIRST CASE of Artificial Breeding of the Pomocanthidae in the world. This information comes to us from our friends in the Republic of China. Although over 100 species of marine aquarium fish have been bred in captivity, the actual number of species produced in commercial quantity is still relatively small. However, work is going on all the time to improve success rates, and not just in the breeding and rearing of “easier” species like clowns and neon gobies. More challenging species like sea horses and pipe fishes, for example, have also received (and are receiving) detailed attention within the industry, with notable successes being notched up by several enterprises, including some of our own members (ROC aquarists). Top: One of several 500 x 500 meter out door mud pond ponds. Middle: 16″/40 cm adult P. maculosus kept at 26Ã‚Â°C sg: 1.024. Bottom: Planktonic eggs 1mm / 1/25″. Now comes news of a new and major breakthrough achieved by one of our ROC members. The successful breeding of two species of marine angels in captivity… and in commercial quantities. 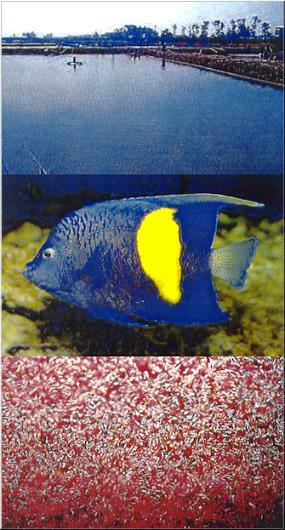 We had known for some time that excellent progress was being made with the Yellow-banded (blue moon angelfish). And the Arabian Angel (Arusetta asfur). We were therefore waiting “with bated breath” to receive official confirmation that the final challenges in the fry-rearing/feeding program had been successfully overcome. This has now been achieved and the group is now in a position to begin trading in captive bred stocks of these two magnificent species. Work began on the angel project in 1995. With the release of small (10 cm / 4″) specimens into some large outdoor mud ponds. It took three full years for these young fish to reach maturity, without human interference, except for regular feeding and water changing. Then, a major breakthrough occurred in April 1998, the first spawning was recorded. However, the team knew that the major challenges still lay ahead. If a successful way of incubating and hatching the eggs could not be developed, or if the fry proved impossible to feed and rear, the whole project would grind to a halt. The first job was to harvest the floating (planktonic) eggs which only measured about 1mm (1/25″) in diameter. This was done on a regular basis during the breeding season (April to June) using fine nets. The next stages were to incubate and hatch them artificially. This proved to be a more difficult process than was originally envisaged. Finally, a successful formula for feeding and rearing the fry needed to be developed. 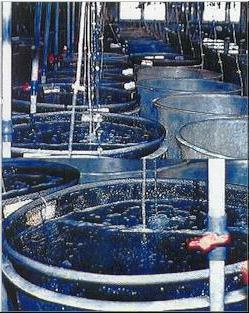 1 meter x 1 meter tubs with heavily aerated fresh seawater. In the end, after several attempts, it was decided to tackle the incubation and hatching of the eggs in two stages. The eggs were first placed in 1 meter in diameter and 1 meter deep tubs containing fresh seawater which was heavily aerated. Once the embryos became visible within the eggs (but before the egg membrane was ruptured), they were gently scooped out and transferred to a large outdoor mud ponds for hatching under natural conditions. Once this occurred and the yolk sacs had been consumed, the small fry were fed on a diet of rotifers and newly hatched brine shrimp (artemia). Later, once they had attained a length of 7/8″ / 2 cm, the diet was changed to a pelleted formulation. With a maximum of three feeds being provided on warm days. Using the above technique, the length of over 10 cm / 4″ was achieved in about one year. 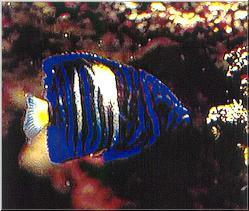 Visitors to Singapore’s Aquarama in 1999 saw evidence of both Pomocanthus maculosus and Arusetta asfur exhibited. Juvenile P. maculosus about 2″ / 5 cm. ready for the ornamental aquarium trade. (Editors note) I have seen hundreds of these magnificent captive bred and reared angelfish. They are healthy, alert, take a variety of foods and have natural colors. They are currently available at better retail stores throughout SE Asia. I feel confident as more breeding pairs of these and other marine angel fish are conditioned and put to the task of reproducing in captivity, these exotic pets will be available world wide. It is the extraordinary efforts like our friends in The Republic of China extended that will guide and drive our hobby and industry into the next stages of development and growth.